If there's one obvious up-side to losing your hair, it's not having to spend all that time looking after it any more! But what many people don't realise is that if you're going to look your best when Bald, caring for your scalp is just as important. Many people have problems with the skin on the top of their heads that are conveniently concealed when they have hair. 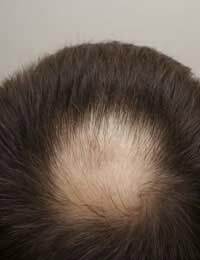 In some cases, these conditions can be related to the hair loss, in others, they're independent. So what should you do to take care of your scalp and what are the other benefits of doing so? Caring for the scalp is not so very different from caring for the rest of the skin, but it's more important to do it regularly because the scalp is exposed to far more potential damage. What's more, the thinness of the skin on the top of the head makes it more vulnerable. Proper care should begin with making sure that the skin contains the right balance of oils. Most people think that washing once or twice a day is a good thing, but it can actually damage the body's natural defences. If you're going to wash your scalp more than once every four days or so, or if you suffer from a dry or flaky scalp, you'll need to treat it to restore the lost oils. Using ordinary conditioner when you shower can help to protect your scalp. You won't need much but you should rub it in and leave it for four to five minutes before rinsing it off. Simple moisturising creams like E45 are ideal for nourishing the skin on the scalp and can be applied before bed so that they do their work while you sleep. If the skin is already damaged, try a cream containing calendula (marigold oil) to promote the growth of new skin. Olive oil nourishes the skin and is good for treating the itchy red rashes that showering can cause some bald people. However, it should never be applied before going out in the sun (unless you wear a wig or hat), as extra oil on the scalp will make sunburn more likely. The biggest single cause of scalp problems for people who are bald or balding is sunburn. As it can also trigger the development of skin cancer, it's important to take the risk seriously as soon as the hair starts to thin. Even in cool weather, sunshine on the scalp can cause damage. Always use a high factor sunblock cream to protect yourself if the top of your head is exposed. If you still have some hair and don't like getting sunblock in it, comb it through and massage it - you'll find that this distributes the cream evenly and stops it looking bad. If you do suffer from sunburn on your scalp, get inside as soon as you can and apply moisturiser. This will help to minimise the damage. If you don't have any moisturiser available, mashed-up banana will do as a substitute and can be rinsed off after a few minutes. Now matter how careful you are, problems can still occur. It's a good idea to get a relative or friend to check your scalp regularly. Tell your doctor if you develop any unusual lumps or red patches, or if moles grow in size. If you don't have anyone to check for you, visit your local well man or well woman clinic regularly and ask for assistance there. Although summer is the most risky time to be bald, cold weather can present its own problems. Rain and snow can naturally be uncomfortable, but hail can actually result in cuts and grazes, so always have an umbrella or hat with you if you think the weather may turn in this direction. Exposure to cold air can be damaging to the skin on its own. In winter you may find that your scalp requires extra moisturising. It can also become more vulnerable to infection, but most mild infections can be treated at home with simple antibiotic creams like Savlon. In really cold weather, it's important to wear a hat. Even people with hair lose a lot of heat through the top of the head, and because this directly chills the brain it can potentially lead to hypothermia. Even if you're Proud To Be Bald, this is a time when you should wrap up and take extra care of yourself.